Dash of Inspiration: Last Day for BYBC! Today is the last day (midnight, California time) to enter our LAST Challenge of 2015! 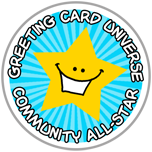 Every artist is invited to attend and BYBC (Bring Your Best Card) created (and approved) in 2015! Collectively we’ll see all the talent at GCU, including all our newer artists who we hope will join in and introduce themselves! If you haven’t yet, find out how to submit and enter your card HERE!